While travelling through Thuringia, east-central Germany, Luther learnt of the peasant unrest that would become known as the Peasants’ War of 1525. Fearful of a divided Christian Germany, he condemned the rulers who oppressed their subjects; he also condoned the killing of the rebels because they had ‘become faithless, perjured, disobedient, rebellious, murderers, robbers, and blasphemers…’. Even though he later modified his stance on this, his reputation suffered. Here is a Latin translation of Luther’s Wider den Reubischen und Mördischen Rotten der Bauern (Against the Robbing and Murdering Hordes of Peasants). It was issued by Catholic opponents in Cologne, and contains a response from Johannes Cochlaeus, Luther’s foe and first biographer. 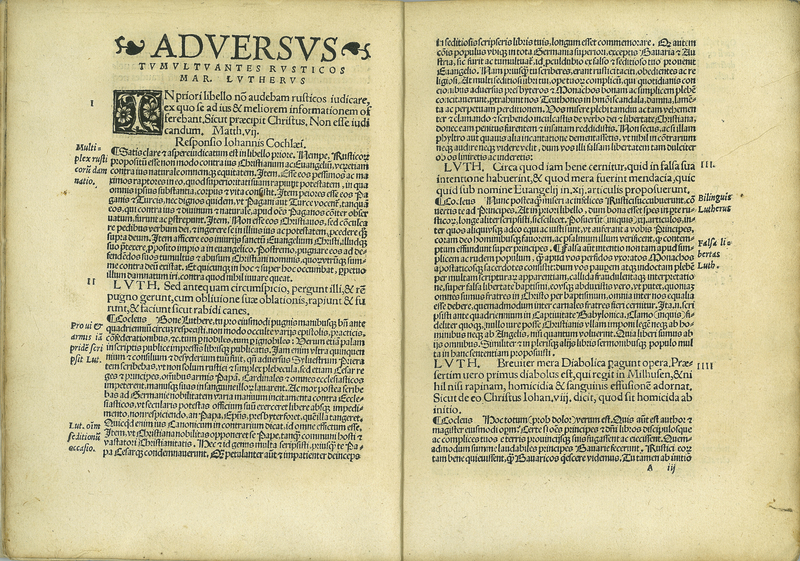 Martin Luther, “Adversus Latrocinantes et Raptorias Cohortes Rusticorum,” ourheritage.ac.nz | OUR Heritage, accessed April 20, 2019, http://ourheritage.ac.nz/items/show/10339.